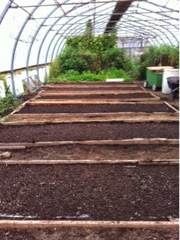 Later in this winter the hoop house will be filled with spinach. Right now it still has tomatoes and beans, carrots and lettuce. But we are emptying it out and replacing with a winter growing spinach. There will be a few herbs in there too, the types that bolt in the summer heat. They don't mind the chill of winter. Right now it looks like nothing. But the sun will come out and the seeds will sprout and grow all winter long. The spinach is crisp, bug free and weed free. So different than summertime when no spinach will tolerate the heat. Getting ready for winter here.